Stimulate and support your immune system when battling flu and cold symptoms, when the seasons are changing, or when rapid response to stress is needed, with this effective homeopathic remedy. 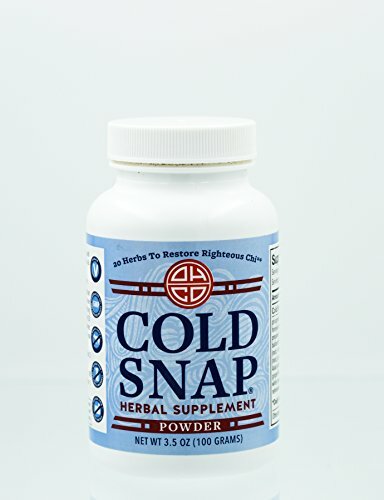 With twenty herbs to restore righteous chi and build your body's own strength to support and heal itself, OHCO Cold Snap was formulated using time-honored traditions of homeopathy and holistic health. Take OHCO Cold Snap to address flu and cold symptoms, or as a daily homeopathic remedy for maintaining strong immunity. Increase amount and frequency of powder to accommodate changes in weather, health or stress. Consider size, constitution, timing, and other factors affecting each unique person. But mostly, throw out the notion that a printed set of directions will provide the exact answer. This homeopathy medicine is safe for all ages, during pregnancy and while nursing. Frequent use (as often as every 20 minutes) may be required in certain circumstances. Do not exceed more than 24 doses in a 24-hour period. Disclaimer: These statements have not been evaluated by the FDA. These products are not intended to diagnose, treat, cure, or prevent any disease. OHCO (The Oriental Herb Company) has offered natural herbal remedies and medicinal herbs to American consumers, using Traditional Chinese Medicine formulas and an East-meets-West approach to holistic health, since 1994. Safe, high-quality, non-GMO formulas and medicinal herbs are double tested for heavy metals, pesticides and microbes and are prepared with traditional artisan "cooking" processes. TRADITIONAL HERBAL REMEDY - Strengthen and support your immune system when battling flu and cold symptoms, when the seasons are changing, or when rapid response to stress is needed. HERBAL MEDICINE - Using the tradition of Chinese herbal medicine, OHCO's Cold Snap has 20 herbs to restore righteous chi and build your body's strength to heal itself quickly and effectively. TAKE AS NEEDED - Take OHCO Cold Snap to address flu and cold symptoms, or as one of your daily remedies. Increase amount and frequency of capsules to accommodate changes in weather, health or stress. SAFE FOR ALL - This thoughtfully-balanced, herbal medicine is safe for all ages, during pregnancy and while nursing. Do not exceed more than 24 caps in a 24-hour period. If you have any questions about this product by Ohco, contact us by completing and submitting the form below. If you are looking for a specif part number, please include it with your message.